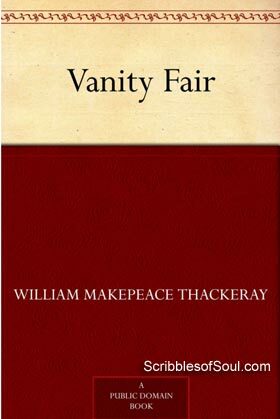 This year on Woman’s day, I stumbled upon the novel Vanity Fair : A Novel without A Hero by William Makepeace Thackeray, quite by chance. As I read the tagline (subtitle), I felt that the novel does seem to be a woman centric novel, without a male chauvinist spoiling the fun. So, bustling with strong feminist notions, I began reading the classic, I often saw listed on TBRs of voracious readers. For the first two-three pages, I actually reveled in Pinkerton’s laughable snobbery, Becky’s hidden cunningness and Amelia Sedley’s honeyed innocence. I expected the novel to be a simple story of friendship, love and betrayal, a usual plot followed by most of the romantic triangles. But, little did I know, that Vanity Fair is not a usual Rom-com, but a worthy satire, dancing on the ignorance of 19th Century English Society, who believed in spending time in idle revelry and gossiping, rather than being concerned about the Anglo French War or the dangers of dwindling economy! In Vanity fair, every whim and fancy of human nature is represented. It is in fact a melee of vain characters, who pride themselves for their worldly wisdom, their ability to swindle the innocent. Becky Sharp’s maneuvers in securing a husband and amassing a fortune, Amelia’s inability to judge her friends and enemies, Dobbin’s foolhardiness in running after an unattainable dream, Senior Crawley and Osborne’s immaturity in dealing with their wards, stupidity of Rawdon and ill diplomacy of Brute and Pitt Crawley, all found a worthy expression in the multitude of Vanity Fair. But, before I dissect the characters any further, let me tell you a little about the plot. The story begins on the Graduation Day of Amelia Sedley and Rebecca Sharp, two young girls, ready to step out of the protected Academy of Young Girls run by the stiff lipped Miss Pinkerton. She claims to transform the young ducklings into graceful swans, with her magic wand of education, etiquette and lots of attitude. She is a die hard fan of Johnson’s Lexicon, gifting each one of her pass outs with a copy of the same. And, while she is quite happy to give Amelia her treasured book, she is reluctant to present the same to Rebecca. Initially, Rebecca and Amelia are in love with each other despite their different nature and status. Amelia is a good hearted innocent girl, who belongs to a worthy family of stockists. Her elder brother Joseph Sedley is a coveted Governor in India. She is betrothed to a handsome Army Man, George Osborne. And, had never in her life thought about hurting someone. In short, she is a lucky charmer, whose past is commendable, present comfortable and future promising. In sharp contrast, Rebecca(Becky for short) is an orphan. Her father was a poor artist, her mother an Opera girl, and she has spent her entire life as a charity student in Pinkerton’s Academy. On surface, she is a plain Jane, with no credentials or relation to settle her in life. But, the nature has gifted her with sharp intellect, ready wit and an easy charm, with which she can swindle as many men as she wishes to! Unaware of Becky’s true nature, Amelia invites her to Russell Square, where Becky senses a fantastic opportunity to ensnare the portly, shy Joseph Sedley as a worthy husband. But, despite her best efforts, her goals remain unfulfilled, and she leaves her good friend Amelia, landing into Queen’s Crawley. One thing leads to another, and soon a whole lot of characters were introduced, ranging from foul mouthed Sir Pitt Crawley, morally upright Pitt Junior and rowdy Rawdon Crawley to the gentle hearted Major Dobbin. The story progressed fast and soon I found myself in the battleground of famous Waterloo, where Napoleon Bonaparte is about to unleash an attack on British Army. The battle changes the fortune of our lead characters. As Amelia loses her wealth, love and status, Becky gains them in the same order. Will a change in fortune bring a solidarity to their friendship? Or will it expose the rickety foundation, Amelia has based her trust on? What would be the final destiny of the self evasive Dobbin and the hackneyed buffoon Rawdon? As Thackeray carried on the narrative, the simple story of two friends expanded into an impressive Vanity Fortress, where cracks are many, and yet the residents are more interested in decking themselves with flimsy attires! The novel is quite good in the beginning. I found the particular stress on Pinkerton’s love for lexicon, a great satire on people who love to use high strung phrases. Similar, was the treatment lashed out to ambitious Mrs Brute Crawley. Another interesting character was the spinster, Ms. Crawley, an old woman, whose wealth attracts greedy eyes. But she is clever enough to protect her interests. Though, initially she does fall for Becky’s charm, but is soon recovered and acts as quite a formidable adversary. But, the best part of the novel is ‘The Battle of Waterloo’, where Napoleon Bonaparte, fondly called Boney, makes a grand entry into the domestic scenes of Vanity Fair. He is responsible for Sedley’s misfortune, Amelia’s tragedy, and Becky’s success. Though, he is nowhere as visible here as he was in Tolstoy’s War and Peace, yet I could feel his powerful influence on the narrative. Thackeray has exposed the vanity of English Society, who were careless enough to indulge in merry making, while the enemy hankered on their borders. In War and Peace, the Russians lost the war, and the defeat changed the fortunes of protagonists. But, in Vanity Fair, the very victory of Englishmen changed the destiny of the characters. Both the novels make use of War as a background, exposing the cowardice of shallow ones, while celebrating the goodness of brave ones. Thackeray, in his inimitable style proves, that even adversity can profit the cunning ones. Even before the War was fought, the best and worst of the characters was brought out. Joseph Sedley’s timidity, Becky’s craftiness, Mrs. Dowd’s generosity and Amelia’s lack of strength, glowed under the mighty torches of Battle. While the opportunists had a field day, the innocent suffered. The author has almost shown the victory of evil over good in a satirical manner. Here, the harbinger of carnage, is lovingly called Boney, who has come to profit the crafty ones. Had Thackeray finished his novel at this stage, he would have still left a worthy story behind. But, he continued much beyond and successfully created a great classic. In a way, the Waterloo was the middle point of the story, where the fortunes of main characters reversed and their destiny changed forever. Further, it serves as the beginning of second generation. The Junior Crawleys and Osborne came into prominence, carrying on the mettle and idiosyncrasies of their seniors in an even funnier way. I liked the fact that the novel does not focus on Becky alone, quite a significant vanity is exhibited by other characters as well. Especially, the episode where auction of Sedley’s house takes place, exposed the insensitivity of high class people, who enjoy the downfall of their counterparts. Also, the utter neglect of Crawley Senior in his last days by his sons and brother, highlighted the lack of love for poor and needy. I almost ended up liking Becky for her straightforwardness, as opposed to double facedness of most of the other characters. But, as the end approached, I felt a sudden change in the tone. Becky, who was till now, portrayed as an other woman behind the curtains, came out in open as an amoral one, who is ready to drop all her guards in lure of wealth and fortune. Amelia continued to be the meek, gentle one, suffering her pains with a sense of misplaced gratitude. While, Dobbin carried on the duties of sufferable ill fated lover. After 400 pages or so, I noticed a strange stagnancy in the nature of characters, despite the increase in the degree of their respective vanities. Unlike Godan or Charitraheen, there was no transformation in the characters. They remained true to their tendencies till the very end. Though, each character did acquire the extremes of goodness and devilry. With the result that the story divided into two worlds – the pristine white and horrendous black, with inmates of both highly unsuited for humanity. I do understand, that it is quite impossible to change one’s nature. But, in a work of fiction, especially the one that spans over 10-15 years, the characters need to learn and grow. The whole purpose of a story is defeated, if there are no ups and downs in the lives of characters, and their interpretations of worldly experiences. I failed to notice this essential change, and that’s why I found the climax to be a bit compromised. It appeared as if William tried hard to adhere to the dictum of victory of good over evil, and ended up creating caricatures of potential characters. Nevertheless, I liked the narrative style, especially the theatrical way, in which Thackeray reintroduced his characters on the stage. Often, while reading, we create a mental image of the persons involved, and when William described those very people by the perspective of another viewer, dwelling on their particular physic, expression and qualities, I had great fun in trying to guess the character under limelight. But, being unaware of the leading social figures of 19th Century Britain, I somehow missed the satirical comments, the author indulged in. I think, it is one of the fall outs of reading a classic, too late in the day. Yet, I found the Vanity Fair, quite a wonderful novel, though a bit tedious and heavy read. Had Shakespeare written a few years later, I believe he must have changed his famous dialogue to “Vanity : Thy name is human” in deference to this not-so-fair voluminous dark comedy, where no man, woman or child is free from Vanity.